Instagram, a video and photo sharing app is becoming increasingly popular among young and older teens. During our parents seminars which we deliver at primary schools throughout the country we are regularly asked questions about Instagram. Parents are most concerned about what their child is sharing via Instagram and who they are sharing that content with. The immediacy of Instagram is also a concern for them, how quickly videos and photos can be uploaded and shared. Also many parents of older children are concerned about the long term implications for their child’s digital footprint. So, as a parent, what is important and useful for you to know about Instagram to help ensure that your child stays safe online? Instagram has 150 million monthly users worldwide. Like other social networking sites the age restriction for opening an Instagram account is 13. We have found from visiting schools to talk to children about staying safe online that they often have Instagram accounts younger than age 13. Kids can post pictures and videos taken with their smartphone to Instagram. People within a user’s Instagram network then like and comment on those images, and vice versa. Instagram offers two types of safety settings, public and private. With the public setting, anyone signed into the Instagram application can view photos or videos on a public user’s Instagram profile. Once you set your child’s posts to private, anyone who wants to see your child’s posts will have to send your child a follow request, which they can then approve or ignore. Instagram also reveals the location of the person who is posting. The option to like follow and share can of course lead to cyberbullying. As always, it is a good idea to talk to your child about who they are communicating with online and about what they are experiencing when they are online. Reassure your child that they are free to talk to you about their online journey, safe in the knowledge that there will not be a negative consequence for being honest with you. Another very important thing to remind your child of, particularly in relation to Instagram is that they should behave in the same way that they do when they are online as they do when they are offline. At our talks in schools we regularly remind children that they should only be friends with people online who they have met in the real world. Reminding your child of the importance of their digital footprint is also important here. Children don’t usually think of the consequence of what they post online. In reality what we post online cannot be easily removed or deleted. One effective way we have developed at Zeeko to explain this is the T-Shirt Rule. Before posting anything online, think: “Would I put this post or photo on my t-shirt so everybody can see it?” The online world is much bigger than we imagine and everything you post will be there for everybody to see it and cannot be easily deleted. Be smart and protect your digital footprint. 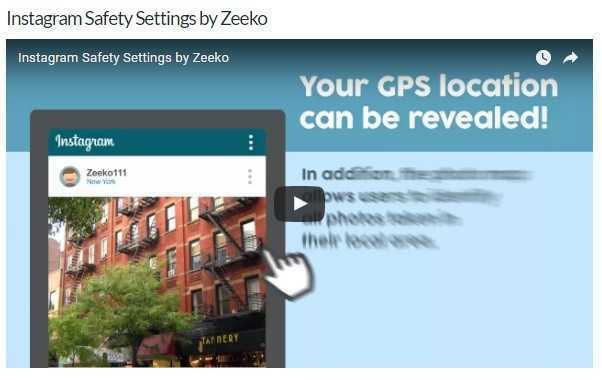 Have a look at our Zeeko Video on Instagram and safety settings. Having an open communication style with your children, regularly checking with them about their online experiences and encouraging them to tell you or another trusted adult about anything they experience online that makes them feel uncomfortable, are all great ways to help your child to stay safe online.